We stayed for three nights at Yellowstone Basin Inn. Janette and Danny were very friendly and great hosts. The pancakes Janette made were so yummy. My daughter loved the rocking chair in the room. The trail course Danny recommended had a great view I won't forget. (Please try!) When we came back home, we realized that my daughter left her favorite stuffed animal in the room. She was very sad. A few days later we received a surprise from Janette and Danny. They mailed my daughter's stuffed animal, even we didn't ask! My daughter wrote a thank-you card for them. (Thank you so much! It meant a lot to my daughter and me.) During Winter, you can also see pronghorn deer near the inn as well. We were lucky to see hornfight of them next to the parking lot. My husband and I stayed 3 nights and it was wonderful. Dan and Jeanette, the new owners, were so friendly. We enjoyed visiting with them. We stayed in the Paradise cabin room. It had a kitchenette, was decorated in a north woods type theme. It was heated by a gas fireplace. It was really nice! The views out our window were just beautiful! We will definitely be coming back! We recently stayed four nights at the Yellowstone Basin Inn on what was primarily a winter cross country ski trip to Yellowstone. The rooms were clean when we arrived and we had a nice breakfast despite being the only ones there for a few days. Contrary to other reviewers, we did not find the new owners to be very knowledgeable about Yellowstone because they are new to the area. Our room wasn’t cleaned once which they told us the first day at breakfast but I found sort of surprising. The decor was dated. On the plus side, the room was very warm and cozy despite the frigid temps. Right close to north entrance. The new owners were so helpful with advice where to go what to see. Spent ages drawing maps and making lists for us. Even lent us bear spray and binoculars and books. They make a fantastic breakfast buffet in the mornings. We loaded up and didn't have to eat again till dinner. Deer grazing on the grounds and a beautiful view of the mountains and herds of elk. Gardiner has all you need for restaurants and supplies. We arrived with no clue what to see or where to go and the owners just took charge. They MADE our vacation unforgettable. Yellowstone is heaven. Greeted by the smell of cookies as we checked in. My wife and I stayed in 11 which had a full size kitchen and amazing views of the valley. Very peaceful and quiet and great stars to see. Thank you for a great place! The Inn is a few miles outside of town with a quiet tranquil setting. Our rooms were very comfortable and clean with spectacular views. We had the cottage Suite which had a fully equipped kitchen.The owners were very accommodating and helpful.They provided us with a lot of information about local sights, restaurants and businesses. Highly recommend the gem. What a great place to stay to put you in the mood to explore Yellowstone. A warm greeting from Dan to show you to your room to make sure you get properly situated started the trip. You start the day by stepping onto the porch to enjoy a great view of the mountains. 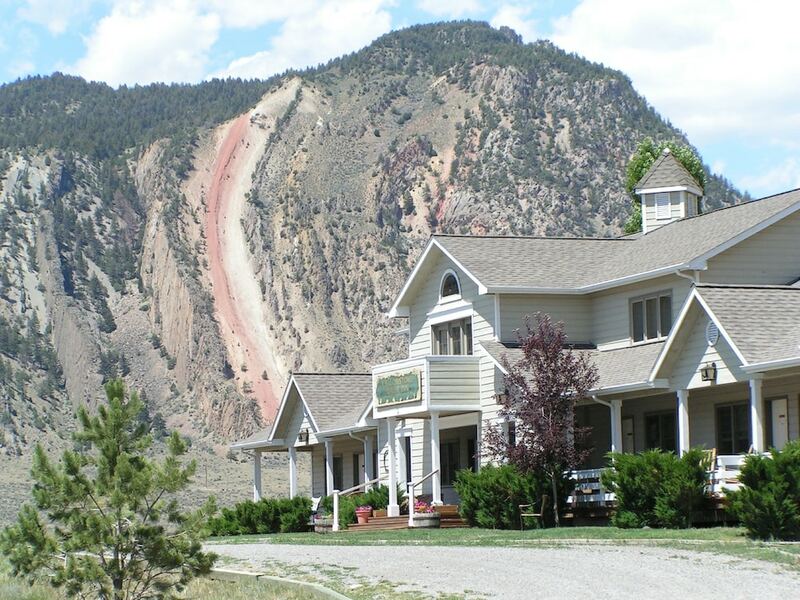 As you walk to the dining room you will see the mountain site "Devil's Slide" ( watch the you tube video 200 elk migrate up devil,s slide )! The dining area is homey, not overcrowded and the freshly made breakfast options delicious. Stayed in the Rainbow Trout room. The beds were comfortable, the towels big and soft, and the heat warm and quiet. I would give Jeanette and Dan over 5 stars if I could. I was fortunate to be able to visit Yellowstone the last week of September 2018. I’m still trying to remember how I actually discovered the Yellowstone Basin Inn ... but whichever way I did, it was the very best stay ever! Jeanette and Danny (new owners) were marvelous, providing gracious and top notch hospitality! And Warren’s breakfasts and packed lunches were nutritious and hit the spot for a day of adventures in Yellowstone! The location is an easy 5 miles north of Gardiner and the northern entrance to YNP. This distance added to the peacefulness and vistas that Yellowstone Basin Inn provides to the NP explorer in all of us — Electric Peak and Devil’s Slide right out your front door. Clean and comfortable room — Hen House. WiFi was very good. I would love to keep the Yellowstone Basin Inn as my little secret, but I can’t. It was a wonderful, restful stay. I look forward to my return with my teenage daughter ... who will also appreciate all there is offered at the Inn. Thank you to Jeanette and Danny and their staff! Yellowstone Basin Inn places you adjacent to Gallatin National Forest. This 3-star bed & breakfast has 14 rooms and welcomes guests with free breakfast, free in-room WiFi, and free self parking. Start your day off right with a free hot/cold buffet breakfast, served each morning from 7 AM to 9 AM. A TV comes with satellite channels, and guests can stay connected with free WiFi. The bathroom offers hair dryers and free toiletries. Other standard amenities include free local calls and a desk. Yellowstone Basin Inn features free WiFi in public areas and a gift shop. If you decide to drive, there's free parking. Front-desk staff can help with concierge services, and provide local restaurant recommendations. This smoke-free bed & breakfast also has a garden. Free hot/cold buffet breakfast is served daily from 7 AM to 9 AM. The preferred airport is Bozeman, MT (BZN-Gallatin Field): 82-min drive, 82.3 mi/132.5 km. Guests with plans to arrive after 9 PM must make arrangements in advance by contacting the property using the information on the booking confirmation.